Classic Heritance® hardwood shutters are plantation-style, crafted from real wood and use dovetail construction for maximum strength and durability. Available in a large selection of stain and paint finishes. These shutters are the perfect example of industry excellence. They were named the 2014 Product of the Year by the Window Covering Manufacturers Association. Available in a large selection of stain and paint finishes. With the option of over thirty-five colors or even any custom color you can come up with, these shutters fit right in with any design theme in your home. Not only do we offer options of just simple paint or stain, but Hunter Douglas Heritance Shutters come with a variety of other options to customize your shutters even further. From glazing the shutter grooves to enhance the profile to combining glazing and burnishing to achieve a worn look to a variety of different distressing techniques, the result you will find will be a look like no other. These shutters combine the simple, natural elegance of wood with custom artistry, letting you create the perfect custom look for your home. 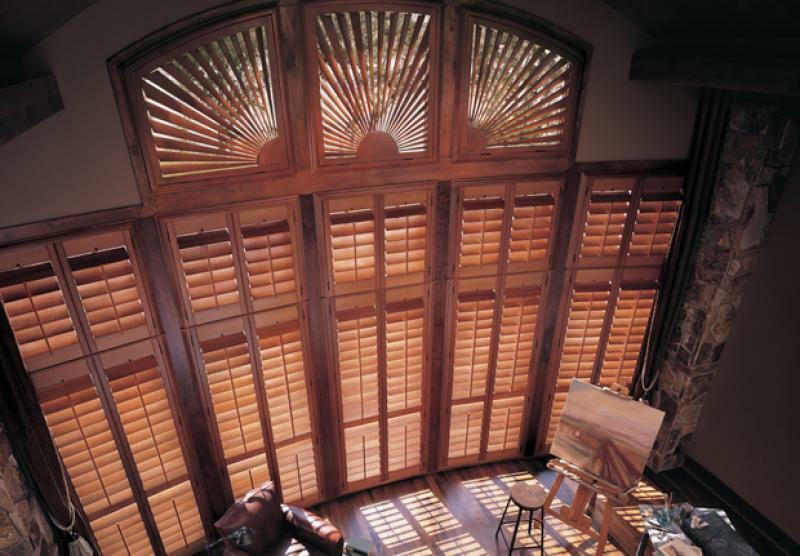 The value-priced NewStyle® hybrid shutters are plantation-style shutters that blend the beauty of real wood and advanced modern-day materials to create a stunning and durable window covering for any room. 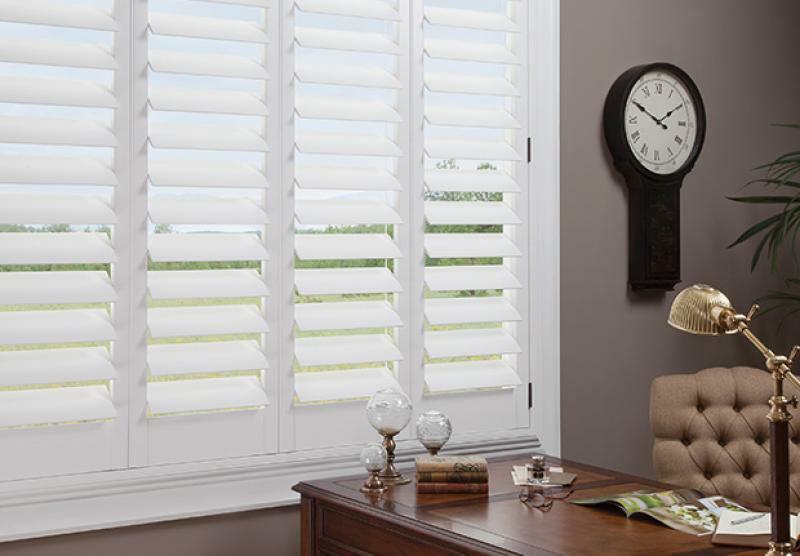 These shutters are extremely versatile and complement any interior. These shutters also are super affordable for any home without lacking in quality or beauty. These shutters also come in a variety of stunning paint finishes and stains to complete any interior design style. 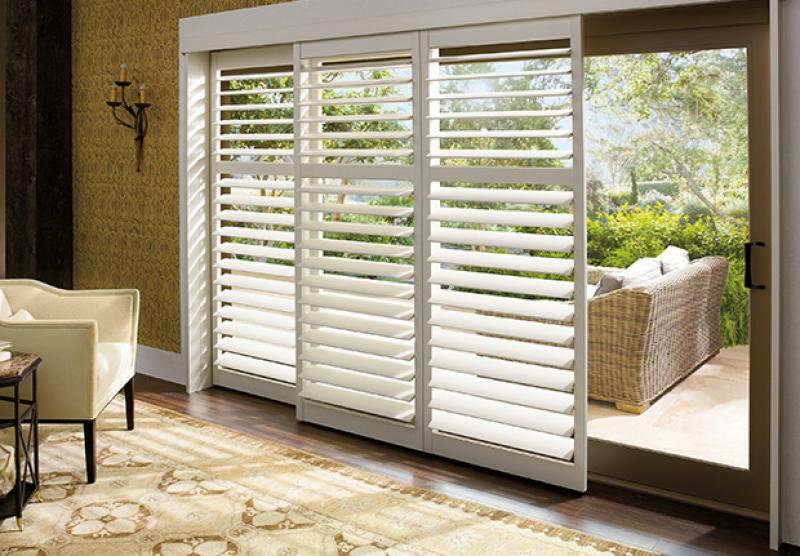 Our Palm Beach™ polysatin shutters are plantation-style, constructed with UV resistant polysatin compound, so they’re guaranteed never to warp, crack, fade, chip, peel or discolor, regardless of extreme heat or moisture. If you are someone who lives in a climate that tends to be hotter or more humid, these are the way to go. The sun’s harsh UV rays have nothing on these shutters because of their unique polysatin compound material. Palm Beach plantation shutters are a beautiful addition to any home and you can be sure they will last for years without deteriorating. You won’t have to worry about spending additional funds to repaint, re-stain, or replace them because of deterioration for quite some time, unlike your typical wooden shutters. In addition to their stylish appearance and longevity, these shutters can also be operated with the PowerView Motorization system which allows complete control from the palm of your hand whether that be through the PowerView mobile app or the PowerView Pebble Control remote. Not only will your home be enhanced in its beauty, you will have super easy control over the amount of privacy and light in your home.